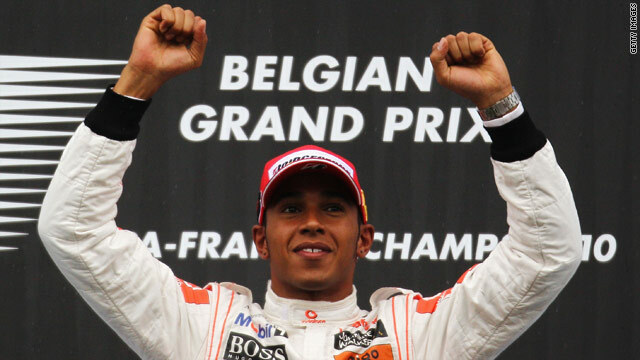 Lewis Hamilton celebrates his win at the Belgian Grand Prix. (CNN) -- Lewis Hamilton stormed back to the top of the Formula One drivers' championship with an impressive victory at the Belgian Grand Prix. The McLaren driver sped past his nearest rival -- Red Bull's Mark Webber -- at the start of the race and didn't relinquish the lead at Spa. Webber came second with Renault's Robert Kubica third, and Ferrari's Felipe Massa fourth. Hamilton's victory means he is three points ahead of Webber at the top of the standings with Red Bull's Sebastian Vettel, Jenson Button, of McLaren and Ferrari's Fernando Alonso all losing ground. Webber was on pole but suffered a nightmare start as five cars sped past him into the first corner. A pile up forced Rubens Barichello's retirement and the safety car came out with rain beginning to fall. Once the race resumed Hamilton built up a clear lead but his teammate Button's world championship hopes were dealt a huge blow when Vettel careered into him on lap 16. The rain played a part as Vettel lost control going into a corner and ploughed into the side of Button's car, forcing his retirement, though Vettel managed to limp into the pits and rejoin the race. "All I felt was a really big bang in the sidepod and I lost drive immediately, I don't know what he was playing at really. From the point of view of the championship, it's a massive blow," Button told reporters. Hamilton remained comfortably ahead of Kubica, who had moved into second, until another downpour forced most drivers into the pits to swap tires. Initially, Hamilton stayed out but quickly headed for the pits once he span off the track. Kubica's slow tire change allowed Webber to nip in front of him and move into second place but the safety car was out again when Alonso's Ferrari became marooned on the track. Hamilton held firm after the resumption to take the checkered flag and regain his lead in the race for the title. After the race he told Formula One's official website: "This last push in the championship couldn't have started better for me; this victory was the perfect way to bounce back from Hungary. "Spa is always one of the most challenging races on the calendar, and I'm ecstatic that I'm now able to tick it off and say that I've won here. "At the start, I was able to pace myself and maintain the gap -- every time the cars behind increased their pace, I was able to answer. Then, when the conditions changed, I had a wide moment at turn eight - and I was on the edge of my seat! "Fortunately, I got out of it, took a step back, regained my focus, and took control again. I was so relieved to cross the line at the end of the race - it was an overwhelming feeling."